VANCOUVER, B.C. - It was billed as a battle between two of the top counter-attacking teams in MLS, but it turned out to be a match of slim margins. Houston looked to have secured a late victory thanks to a Mauro Manotas goal. However, Kendall Waston scored Whitecaps FC's first set piece goal of the season deep into stoppage time to rescue a point in an entertaining 2-2 in front of 18,813 fans at B.C. Place. Tomas Martinez and Jose Aja exchanged first half goals. Kendall Waston hit the crossbar, and Brek Shea missed an absolute sitter in front of goal. The match looked destined to finish 1-1, but Manotas and Waston exchanged momentum and late goals. Each team left the match disappointed not to have won outright. Whitecaps FC improve to 4-5-2 on the season and Houston sits with a 3-3-3 record. The Big Man grabs the equalizer in stoppage time! Moments of the Match In his first start with Whitecaps FC, goalkeeper Brian Rowe was tasked with turning aside the highest scoring first half team in MLS. The Chicago native earned the start after goalkeeper Stefan Marinovic, sustained a left knee sprain in training on Thursday. Rowe was sharp in net as the Dynamo looked for an early edge. "It was great, it’s been a while." Rowe spoke about his debut with Vancouver. "I’ve been patiently waiting, and I hope Stefan (Marinovic) is alright. The job of being a goalkeeper always requires us to be ready. Awesome for me to step in for a home game, being able to get my first minutes as a Whitecap. It was a rollercoaster of a game, starting behind and then we were all over them, getting a goal right before halftime giving us good momentum into the second half, and unfortunate to concede that one towards the end, but I think we showed a lot of character, a lot of grit pulling that last goal out and getting a point out of it." Kei Kamara and Anthony Blondell were tasked with leading the line for Coach Carl Robinson in an offensive minded 4-4-2 formation. Both Blondell and Kamara had several first half chances in front of goal only to watch as their shots sailed well over the bar. Scoring was not a problem for Houston and they quickly opened the scoring in the 35' minute against the run of play. Alberth Elis was causing all sorts of trouble on the left flank. He crossed the ball into the Vancouver box in the 35' minute. A streaking Tomas Martinez was an unmarked fox in the box. He deposited his second goal of the season. Whitecaps FC caught a lucky break just before halftime, and Vancouver's centre-back duo combined to score. Waston moved up and danced around the end-line before delivering a goal-line cross to Jose Aja. The 25 year-old, who celebrated his birthday on Thursday smashed home his first career MLS goal to square the match at 1-1. “I was very happy." Aja said. "I was looking for that goal every game. I scored on my first day of 25, so I was really happy. I was happy to help the team and happy to score the goal." Vancouver was the more determined team in a second half that featured next to nothing in the way of scoring opportunities for Houston. The Caps countered with chance after chance as they looked to bread the deadlock. Waston was leading by example. The skipper hammered the ball off the Dynamo crossbar in the 77' minute. As Vancouver was throwing everything at Joe Willis, the unimaginable happened. Houston did what they do best. 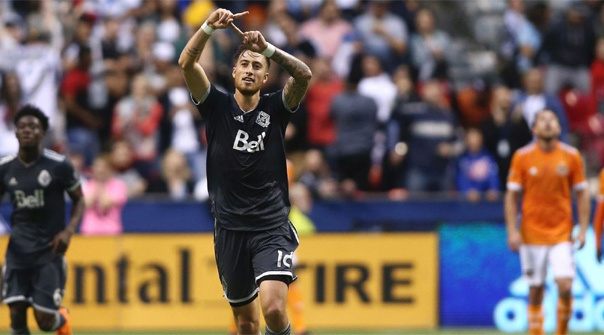 They counter-punched Whitecaps FC on the run and scored what looked to be a match winner off the boot of Mauro Manotas in the 90' minute. The Caps had four minutes of stoppage time to try to find a late goal. Kendall Waston came through in the clutch for his first goal of the season. Felipe delivered a free kick that Kei Kamara headed into the box. Waston leaped up above everyone else and headed home the ball past Willis to give Vancouver a late goal and a hard faught 2-2 draw. “To be honest I was catching eyes with Felipe, to see if he was going to (kick) it to me." Waston said. "But he do me like a kind of, that he was going to (kick) it to Kei (Kamara). I just sprinted in when Kei was in the sky like Michael Jordan, and I just tried to jump as high as possible – not like him – but I could score." It was a rollercoaster of emotions in the second half. Vancouver should have won with all the chances they created. Houston then looked to have won themselves, but the football gods weren't about to let Whitecaps FC come up short and they found a way. Jose Aja made the difference at both ends of the pitch. He defended soundly and he scored his first half goal in a timely fashion just before the interval. Aja has settled in nicely after an up and down tenure with Orlando City SC last season. The Caps centre-back has formed a solid pairing with Kendall Waston. Aja showed exactly why he is another aerial threat for Vancouver both offensively and defensively. Houston Dynamo Starting XI: Joe Willis; Adolfo Machado, Alejando Fuenmayor, Leonardo(C), Andrew Wenger; Eric Alexander, Tomas Martínez, 71 (Luis Gil) Darwin Ceren, 14 (Boniek Garcia); Alberth Elis, 73 (Arturo Alvarez) Mauro Manotas, Romell Quioto. 4-3-3.